A white gamer badge with a black control pad and the text I have control issues in black text. 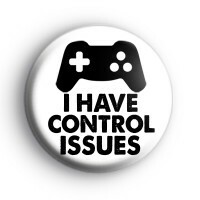 This is a badge for all of you console gamers out there. Mr Kool Badges is an avid gamer. From the Sega Master System and Nintendo NES right through Sega Megadrive and Super Nintendos and on to Amiga CD32, Atari Jaguar, Sega Mega cd, Game Gear, N64, PlayStation & now Xbox, Xbox 360 & Xbox One, we have been through a lot of consoles. We still have a few consoles in the workshop for downtime so this badge is as popular here as we hope it will be with you. Whether you are a fan of RPG, adventure games, platform games or first-person shooters, we are all familiar with our favourite control pad. Standard 25mm control pad badge made in our UK workshop. We have a great range of geek badges, gamer badges & nerd badges on our website & we are always open to new suggestions so get in touch on social or via email.